Kotondo, Torii (1900-1976) "No. 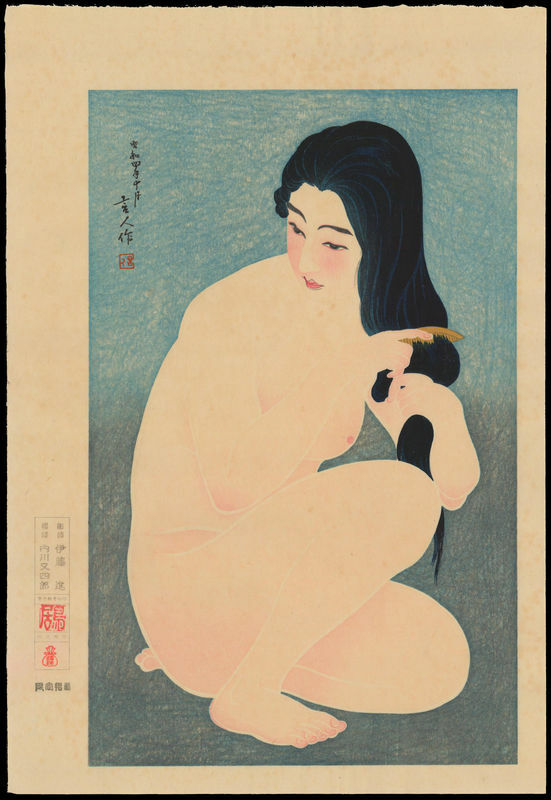 12 - Combing In The Bath" - Woodblock - Chinese and Japanese woodblock prints for sale, silkscreen, scrolls, watercolor, lithographs. Artwork Details for Kotondo, Torii (1900-1976) "No. 12 - Combing In The Bath"
Condition: Very good but some light spotting in the image area and margins. Notes: From the full set of twelve scenes. This print has Kotondo's signature and seal within the image area; Printer and carver seals, red Torii artist's seal, red publisher's 'moneybag' seal (left margin); Watermark in lower left margin. Nearly double-oban in size. Published circa 1980s. Carver: Ito. Printer: Watanabe. Includes original deluxe presentation folder.